RALEIGH, N.C. (WTVD) -- The Wakefield High School student who was brutally beaten in a gym class Thursday is now recovering from surgery. When Wood Williams awoke from surgery Tuesday his badly broken nose had been fixed. But the 16-year old's surgeon now wants him to see a neurologist. "There's a couple things that they just wanted to follow-up with. It didn't look quite right," Williams' mom told ABC11. But for Ashley Williams-Marble and her son, there was also uplifting news. 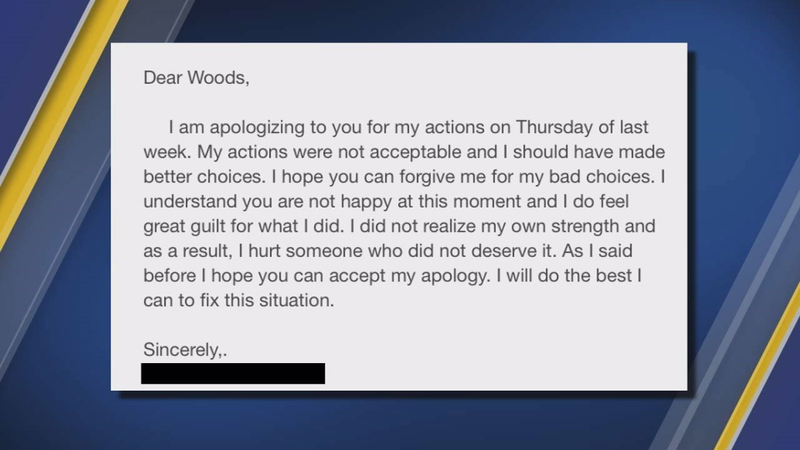 The principal at Wakefield High School forwarded a letter from the 15-year-old boy who beat him up during a gym class basketball game. It says in part: "I did not realize my own strength and as a result, I hurt someone who did not deserve it." The 15-year-old student went on to write: "I will do the best I can to fix this situation." He added: "I hope you can forgive me for my bad choices." That request has been granted, Williams' mother said. "He's probably hurting too. And he's human. It takes a brave person to, you know, to say that you're wrong and admit and apologize." Because the boy is just 15, he cannot be charged as an adult but Raleigh police say they have filed a juvenile petition. 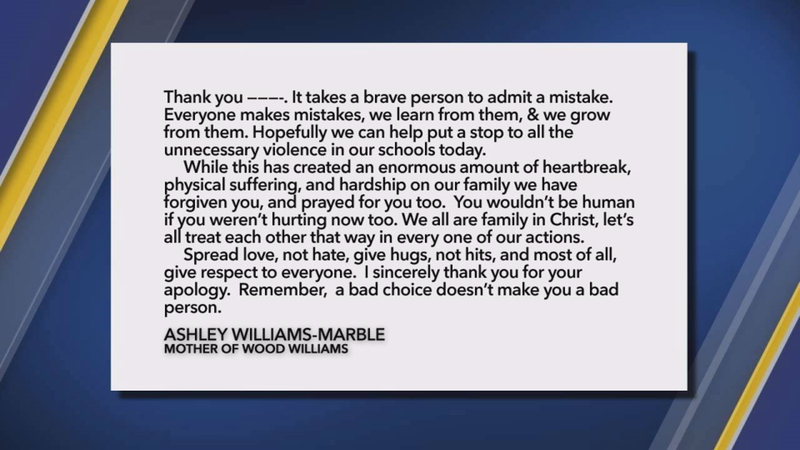 Williams-Marble has even penned her own letter to her son's attacker telling him he has been forgiven. The letter from the other student has silenced some critics on social media who Williams-Marble is also forgiving. Many people posted comments questioning whether her son was telling the truth or provoked the fight and her motive for speaking out. "I've heard a lot of things, you know, like, 'She wants money. There's an attorney.' We don't have an attorney. We haven't filed any lawsuits," she said. Her only motive, she said, was to point out concerns about safety at Wakefield High and other schools, and what she believes is a punishment that is too lenient. She says the other student got only a five-day suspension and will be back in class before her son is. "I just pray that there's going to be some healing and there's going to be some awareness within the school system, within our state, within the walls of Wakefield High School," she said. Principal Malik Bazzell sent a letter to parents Tuesday that read, in part: "Violence or aggression of any kind is NOT tolerated at Wakefield High School. Our staff works diligently and competently to address any such act or threat. I am confident in their collective ability to do so. We have many measures in place to discourage violence in our school so that we are a safe school." An incident involving an assault on a school campus elicits a variety of reactions and emotions, and rightfully so. No one wants to see a child injured; when it does happen, the desire for due punishment is warranted. Such an incident recently occurred in our school. Reactions were understandably strong. While I cannot share details due to protecting privacy of all students involved, I can share with you Wakefield High School's perspective around violence and disciplinary action. First, violence or aggression of any kind is NOT tolerated at Wakefield High School. Our staff works diligently and competently to address any such act or threat. I am confident in their collective ability to do so. We have many measures in place to discourage violence in our school so that we are a safe school. In addition to character education programs such as PRIDE and AIM, my team employs the "sweating the small stuff" philosophy around discipline. This means early identification of students who are routinely tardy, who skip classes, or who violate the dress code are immediately handled. This allows individual attention to address specific issues to prevent more serious violations. If a serious act such as an assault does occur, we immediately involve law enforcement. This includes our School Resource Officer (a Raleigh Police Department officer) and our school district's security team.The involvement of law enforcement means that a student may or may not be arrested or charged with a crime. If a student is charged, legal disciplinary action now rests in the hands of the courts, whether the student is considered a juvenile or an adult. Regardless of whether a student is charged or not, school safety is of paramount importance, and appropriate disciplinary action within the school lies with me and my administrative team after a thorough investigation. Our decision is based on guidelines set by Board of Education policy with the safety and security of students always at the forefront. While principals have some leeway in administering discipline, the action must fall within policy guidelines. We take the administration of discipline very seriously, as we know the impact it can have on student safety, as well as the impact it will have on the academic success of all concerned. Please know that my door is always open to your concerns, questions and suggestions around school safety or any issues that affect the overall health and success of our school. We look forward to continuing to partner with you in order to keep Wakefield High School a safe place for all of our students. Thank you for your ongoing support.